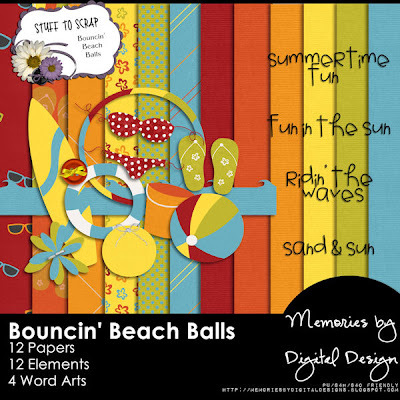 The Stuff to Scrap (STS) family of designers & members has a bright, beachy-fun blog train for you this month. Go to all blogs and collect all the parts. It will give you one mega-kit!! I actually suggested this color palette and after a vote - it won!! I jumped at creating my mini-kit (almost a full-kit size). It has 12 papers, 12 elements, and 4 word-arts. Hope you love it as much as I do! Click here or the full preview image below to download my part!! Thank you so much for this post. I want to let you know that I posted a link to your blog in CBH Digital Scrapbooking Freebies, under the Page 11 post on Jun. 01, 2011. Thanks again. great color suggestion. so fun, thanks! I love blog trains!! Thank you for sharing! Great job Tammy! Thanks for the freebie! love, love, love the colour palette . . . can never get too many brights LOL. Thanks to ALL the designers for a terrific blog train!